Now, whatever one’s view about Volkswagen’s heartland model from a stylistic perspective, we can probably say without fear of dissent that Giugiaro’s original (Typ 17) design was pitch perfect, even if VW’s own styling team (of which Herr. Schäfer would undoubtedly have been part) most likely lent considerable detail finesse to the finished product. Nevertheless, Mr. Schäfer’s vainglorious statement might have proven a tad less difficult to swallow had Herbie not presided over a design heritage which was notable primarily for the advent of what became known in its homeland as Heidedesign – a soubriquet which encapsulated a drearily provincial form of ‘Keeping Up Appearances’. Schäfer’s tenure as VW’s stylistic overlord and tastemaker encompassed amongst its highlights the second-generation Golf – a car which despite its undoubted competence maintains a frankly mystifying level of affection and regard. Certainly, as a stylistic sequel to the original, it was a rather (ahem) underpar, and distinctly bloated-looking one. Also attributed to Schäfer’s leadership is the car which formed the basis for what confronts us here. The somewhat overdue 1992 Golf Mark 3 proved a rather troubled programme for VW, both stylistically (subject, it’s said to significant fiddling quite late in its gestation) not to mention in engineering and build terms. Styling credit it appears can be laid at the door of J. Mays, although if indeed this is accurate, I somewhat doubt he dines out on the fact. Certainly one of the more frangible of the Golf generations, the Golf 3 remains undoubtedly amongst the least regarded. Marrying the first and second generation’s angular silhouette to the softer surfacing of the 1990s was never going to be an easy transition to master, but Schafer’s design team cannot be said to have made a success of the task – although how much of this can be attributed to political meddling versus stylistic myopia is difficult to accurately pinpoint. Certainly, Golf 3 was an unhappy looking device – one to which old father time has not been especially kind. Least attractive of all perhaps being the cabriolet. An in-house design which supplanted the original (Typ 155) Karmann-engineered and built version which remained in production throughout the Mark 2 model’s career. VW either couldn’t (or wouldn’t) justify its replacement in 1983 (the Cabriolet being a fairly low-volume and expensive to build product). By its April 1993 demise, the first-gen Cabriolet had been subjected to a series of unfortunate facelifts, before finally bowing to the inevitable with close to 400,000 examples emerging from Osnabruck. The Mark 3 Golf Cabriolet was introduced in 1994. The conversion and folding roof remained Karmann’s responsibility, the facility even allegedly opening a department in VW’s Pueblo plant in Mexico where the US market Mark 3 Golfs were built. In 1998, following the introduction of the return to form Mark 4 model, the Cabriolet received a nose and tail-lift to bring it into line with the new-generation body design – unofficially known as the Mark 3.5 Cabriolet – no Mark 4 Cabriolet being sanctioned. Whether in pre or post-facelift guise, the Mark 3 Cabriolet remains a rather plump looking device, entirely lacking the clean surfacing and relative litheness of the original car, especially from the rear three-quarters. Here the bulk of the bodysides (despite the wedge profiling of the rear deck which attempted to inject some much needed dynamism to proceedings), lent the Cabrio a distinct perambulatory appearance, not helped by the Mark 4-inspired sheer bootlid – all that’s really missing is a handle, a pair of pram irons and perhaps an infant. The Mark 4 revisions are better handled at the nose, where headlamps, grille and bumper are quite neatly integrated, although like most facelifts, it cannot be said to be a significant improvement upon the earlier iteration. Different, rather than better. Cars such as these require a high degree of commitment from their owners in this part of the world, so one really ought to commend the keeper of this one for (a) putting up with the inevitable compromises such a vehicle would entail for the annual half hour or so when the sun can be counted upon to reliably shine and (b) for maintaining it in such robust condition (the odd scuff and scratch notwithstanding). That said, while an earlier Golf Cabrio might now be deemed a classic worth preserving, it’s difficult to imagine a following emerging for this iteration, handicapped as it is by its dowdy appearance which never quite lent the requisite fascination. Surely a convertible lives or dies by its style. What’s that you were saying, Herr. Schäfer? Driven to Write wishes a happy St. Patrick’s Day to all our readers. And a happy St. Patrick’s day to you to, Eóin. 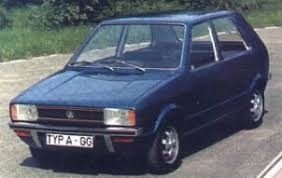 I well remember the launch of the Mk2 Golf and my disappointment at its appearance. It had lost the crisp precision of the original in favour of, well, nothing particular, just a slightly bloated and more rounded form, which lost the definition of the original’s features. It was, of course, a more substantial and durable car and, dynamically, was equal to or better than the original. This quality was lost with the Mk3, which completed the Golf’s descent into middle-aged corpulence. The Mk4 was an impressive return to form in design terms, if still a pretty inert drive. The Mk5 was another disappointment, with rounded forms and fussy detailing. The Mk6 was a very impressive facelift, losing the fussiness and making the Golf look much more, er, Golf-like again. The Mk7 sharpened the look up further. Spy shots of the forthcoming Mk8 suggest another evolution, although the proportions look slightly odd, with a very low and downward curving bonnet making the front end look rather too small for the rest of the car. The Golf is such an icon that it is quite a challenge for any designer to match the best of previous generations, and some have missed that benchmark by quite a margin. If I were to rank the generations purely on design, I would go for 1, 4, 6, 7, 2, 3, 5. While I’m clearly no fan of the Golf II, there’s no denying the fact that it was the generation that truly defined the Golf. Its air of stuffiness is much more in keeping with West German values than Giugiaro’s crisp, slightly dashing effort. In that sense, Schäfer did define the modern Volkswagen. By the way: During his brief stint at VW, Patrick le Quément established the ‘Stylingrad’ monicker to describe the city of Wolfsburg – and, arguably, the design spirit at that place, at that time. 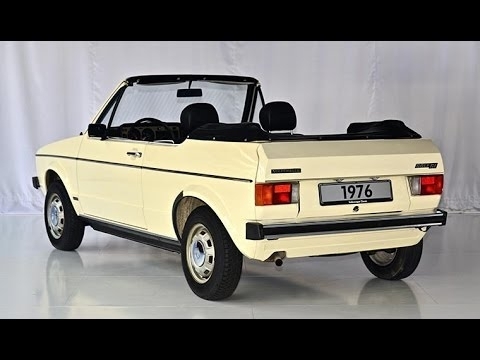 Apparently VW completed a prototype Cabrio as far back as 1976, but didn’t get around to building it until around ’79 or so. By coincidence, I spotted a very tidy looking Mark 1 cabriolet in town this morning. By contrast to the car above the design has stood the test of time considerably better. Christopher makes a good point. Without the conservatism of the second-gen model, the Golf might never have become the sector-titan it is today. Regarding the various iterations; for myself, only the 1st and 4th generations really stand out in styling terms. The current car (pre-facelift anyway) is one of the better efforts and yes the facelift 6 was a huge improvement on the risible 5, but from what I have seen so far, Golf 8 will not be a classic vintage. The Golf Mk1 even rusted like a contemporary Fiat! The Gold MK1 was an astonishing achievement when one remembers that its design was massively restricted by the necessity to use as much of the Beetle’s production equipment and processes as possible because VW was bankrupt at that time and could not afford further investments in its production infrastructure – this forcibly made the Golf inherit the 2,400 mm wheelbase from the Beetle as well as the way the body was welded together starting at the back and putting the roof in before the floor pan and the way the doors were built. All these shortcomings were hidden in Italian style clothing. That the Mk1 came out so good was a miracle and it’s an everlasting credit to Prof Fiala. The Mk2 brought the car up to the size of its competitors (remember the discussion on sizes of Escorts et al. a couple of days ago) and the Mk3 (together with Passat Mk3) was a sign that VW had lost the plot under Carl Hahn. That Hahn’s successor had to show his chassis engineers how to properly set up a car tells a lot about the dysfunctionalities at VW during this time. Carl Hahn and Fugen-Ferdl were the exact opposite of each other in most respects. I know which one I’d prefer to go on holiday with, but I also know which one I’d like to make the product & engineering decisions. 1984. International trade fair. New products from various companies. One big star: the new Golf. In red. Shining . It’s the only thing I remember And so do all of my elementary school classmates. Quite a few teachers bought it! There were some Golfs around allready…mostly beige and white, diesel vans -the 1.5 notorious, the 1.6 much better. Petrols…not so many… A few 4 doors in a somewhat fainted pastelish skyblue colour…not a super car except that GTI thing! But the 1984 red star…It still shines in me! Well this article has highlighted the lack of discernment in the Mark household when it comes to buying cars; we have owned the three least desirable models and honestly they didn’t seem that bad. The red Golf 2 diesel was bought new in 1984 and it seemed remarkably solid but with ponderous handling and glacier like acceleration. It was however replacing an Alfasud 1.5 Ti which had taken me at speed and backwards in to a grassy bank. The Golf was amazingly spartan; no PAS, no central locking, not even a radio.It took me all round the west of Ireland fishing and the five of us on holidays to France and Italy. Passed on to our son it survived until 1999 when replacing the injectors was going to cost far more than the car was worth. The Golf 3 diesel arrived in 1994 and for us seemed a definite improvement on the 2. Much quieter, better equipped and it did turn corners with considerably less effort. Passed on to the youngest daughter, it saw out its days in Edinburgh where in 2009 she traded it in under the scrappage scheme for a Fiat Panda. She asked me to check the noise from the engine when cornering and yes a warning light came on. 3 litres of oil solved the problem. The 2005 Golf 5 was the only one that was imperfect. It had an intractable water leak in the boot and eventually I dealt with this by removing one of the bungs in the boot floor to allow drainage. Clutch failure at 11 years and front spring breaking at 12 years sent it to webuyanycar. With the 1.9PD diesel it was great fun to drive; masses of torque and 50+mpg. So in a total of 42 car years we had one MOT fail, one break down (clutch) and one major component fail (the spring). Did the styling matter? No these were “tools” and did exactly what was expected. Reliable and rust free in this wet outpost of western Europe. Would we have had greater satisfaction from the more desirable models? Who knows. Oh dear: if this image is accurate, then the Mk8 won’t be in the upper half of my design rankings. 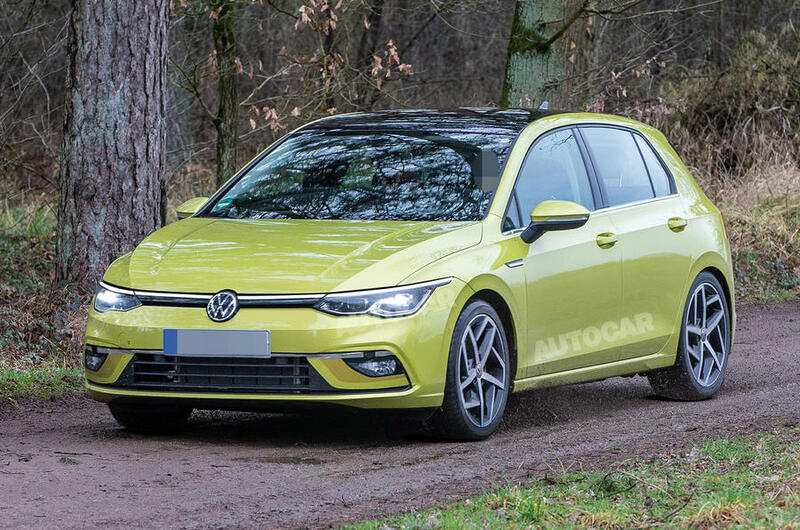 According to Autocar, its release has been delayed to Spring 2020, but it’s still too late to do anything about those weird proportions. I see more forced shadows: the wheel arch forms are slightly concave. Or will they be? I will have to reserve judgement. Lamps? Hmmm. VW seems to have found a way of dealing with pedestrian protection regulations without having to make the car’s nose look like a hippo’s, maybe there’s a trick underneath that semi clamshell design. But those E60-style eyebrows on the headlights are absolutely unforgivable. The major change in proportions over the Mk7 seems to be lowering the waistline and increasing the glass area. While the latter might be welcomed by smaller passengers, it does seem to give the car a rather top-heavy stance and it lessens the “solidity” I always associate with to the Golf, Mk1 excepted. Dave, you’re absolutely right. That fussy headlamp treatment has no place on a Golf. Maybe the launch delay is about making last-ditch changes to some of those details – lamps, bonnet profile, side panel surfacing (sic). I remember buying Autocar the week the Golf 2 was launched and trying to get my head around what VW was trying to achieve. For me, no matter the wheel and tyre spec (16V excepted) it always looked too large for its tracks and wheels. But then, I recall being given a ride in a GTi version by a colleague some years later and thinking what a well dressed and built thing it was. Overall, it came into its own as it matured and could, therefore, be argued to be something of a trend-setter. Golf IVs still look great, inside and out and I love the idea of the V5. The VI was a brilliant bridge between the V and VII and the latter still looks fresh, smart and like a quality item. I’d take one every day over the new A-Class, Focus (getting worse every time I see one, and the estate is especially weak looking), et al. My impression of the new Focus is very similar to yours. Just this morning, I came across a white estate, which looked as though is heavy extremities where on the verge of tearing it apart. Hmm, the new Focus doesn’t improve on further viewing. It manages the unusual trick of being overwrought and anonymous at the same time. I wonder if Richard has spotted a one yet? I think I read once that Opel were taken aback when the Golf Mk2 was revealed. 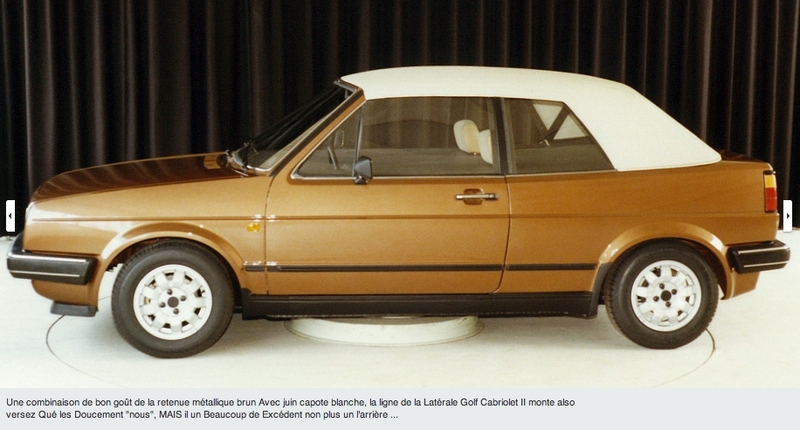 The Kadett E was a radical aero car because they were expecting the new Golf to be as well. I really rated that Kadett E/ Astra 2 – it had an excellent 1.4 l petrol engine married to a fine 5 speed box, and looked like the future, especially in GTE form.